Merry Christmas! Home for the Holidays Part 4! Merry Christmas everyone! and thanks to Santa for delivering all the artgoodies packages to the good girls and boys! Christmas Pie! It just wouldn't be a holiday without one of my homemade pies! 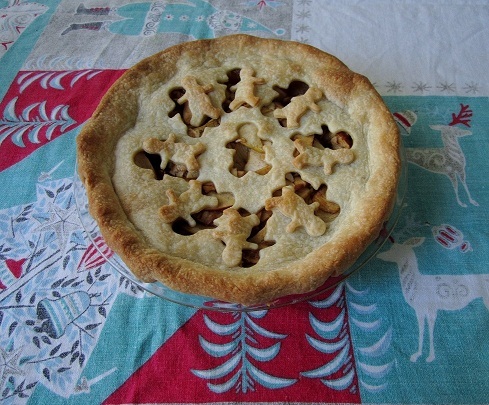 Apple pie with cute gingerbread cutout crust! This is what lies below the amazing vintage felt Merry Christmas banner that I hang every year. You can check that out in last years holiday post. Santa's sleigh is full of funny little elves. He stands behind with his trusty reindeer! A variety of plastic and sawdust stuffed Japan and Hong Kong friends await a busy eve! Check out those green glittery ones! So close to the holiday! Hard to believe it, mainly because we are lacking snow I think. There’s always a bit of an eery calm in my studio and house as the packing and shipping and making slow to a near halt. I have cookies and cupcakes in the oven for tomorrow’s festivities and I even got to see my favorite movie, White Christmas, on the big screen yesterday! I have to say I’m really enjoying my friend and family time this year. I hope everyone gets to have a little break this year and spend some quality time with the most important people in their lives. 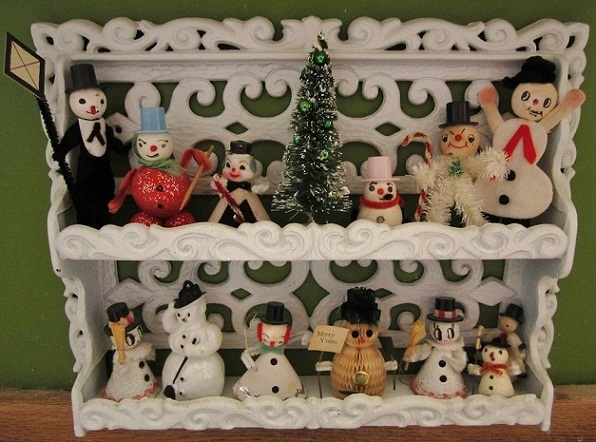 Oodles of vintage holiday friends sit atop my side table in the dining room! You've already seen the blue reindeer in part 1 and they've got plenty of friends! This years lovely little tree was purchased at the farmers market! Just the right size to sit atop my vintage kitchen cart which conveniently holds my presents. 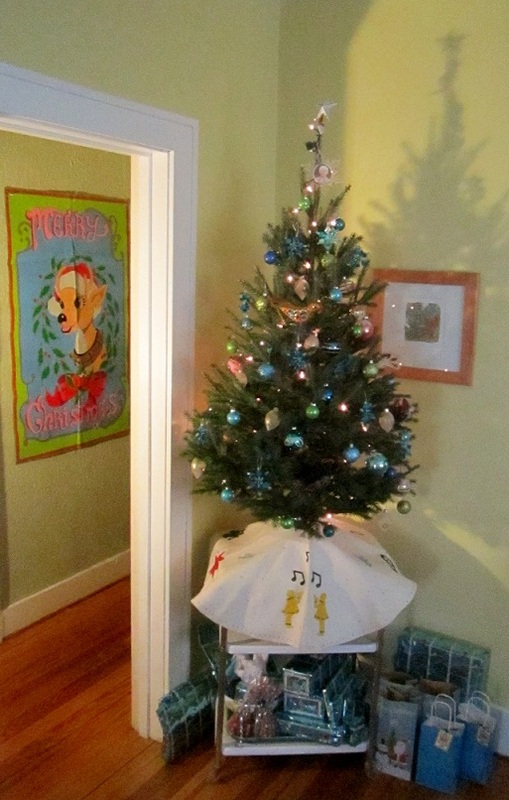 The tree is decorated in vintage and modern ornaments and new this year is the sweet vintage felt tree skirt! Plus I remembered to snap a pic of the hand painted Rudolph Banner circa 1950 something! I’m still having a hard time believing it’s the middle of December! 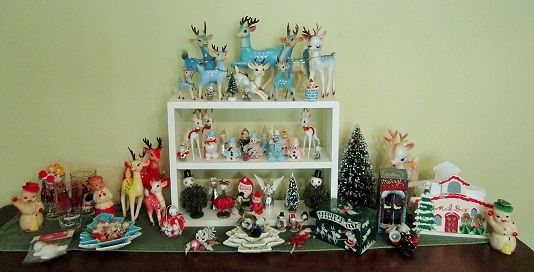 Here are a few more holiday decor pics artgoodies and Vintagegoodies style! There are a few additions this year to the snowmen lineup! The awesome snow friend in a tux on the upper left, also the red glitter snowman to his right. He looks a little grumpy which is extra kitschy and I of course love that! Also new, the snowman on the bottom 2 in from the left who's tippin his hat to ya! I've been meaning to take an updated dining room pic for awhile now. New additions are the vintage shell chairs, my grandfather's vintage console radio, and my grandma's amazing vintage barkcloth curtains in the rare black zomba pattern! 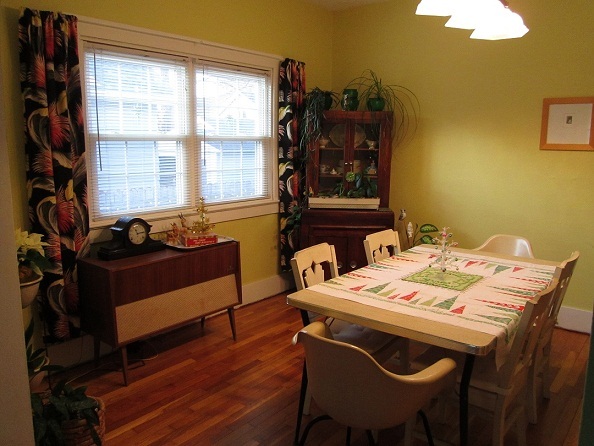 The table is decorated with a vintage mid century tablecloth and hard to find mini shiny brite tree. The console radio is also sporting a vintage gold tabletop tree made in Japan and some vintage rubbery reindeer friends! 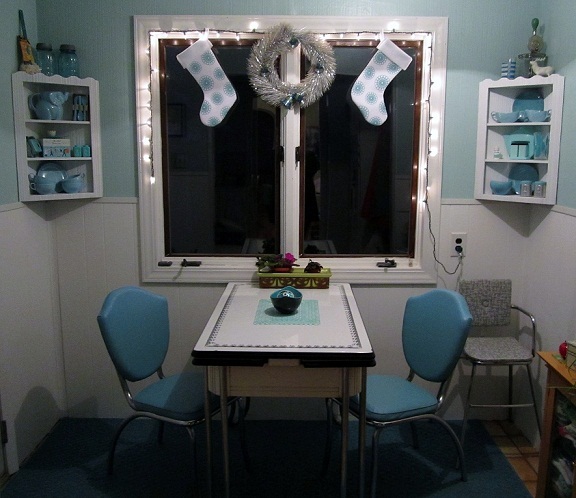 New to the kitchen nook this holiday are a couple of artgoodies doily pattern stockings in light aqua. I think Santa would enjoy his cookies here, don't ya think! You can get your own artgoodies stockings made of recycled felt in red doily, elf, and snowflake designs! Travel is done for the year, and what a busy busy fall travel season it’s been! I’m home for the holidays and started December with a local show at the UICA, Urban Institute of Contemporary Art, Holiday artist market. The holiday decorating has also begun at home with my vintage Christmas collection! 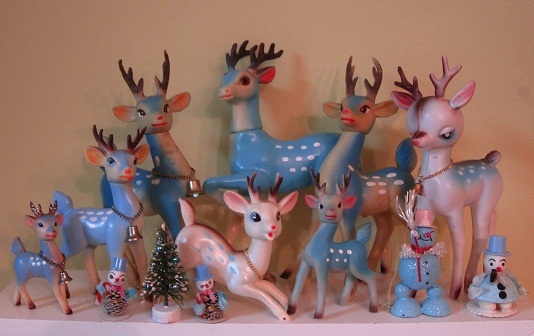 New additions to my vintage blue deer collection include the round headed cutie on the right with blue back and eyes, the little cigar smokin blue snowman below him, and the smaller sized blue rubber reindeer to the right of the one with the blue spots! I brought out my awesome mid century shelf for this years display! It is so amazing, the shelves come off and it folds flat, not to mention it holds my artgoodies product perfectly! 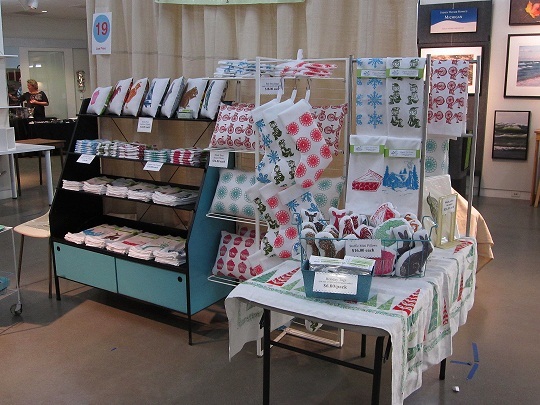 New shams and stockings were on display along with the rest of the lineup! The all over prints were a popular item this year!